The San Marcos Planning & Zoning Commission approved the Parks Master Plan on August 10. The commission passed the plan with amendments to add 6 city-owned parks that had been overlooked in the first draft and incorporate a Greenbelt Master Plan into the document. As opposed to an free-standing greenspace, a greenbelt is a long swath or corridor of open land that could ultimately surround the city. 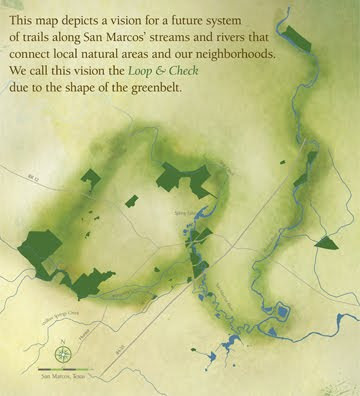 A greenbelt has trails providing interconnected transportation routes as well as wildlife corridors, habitat, and watershed protection. The plan that SMGA envisions contains land that goes mainly along the San Marcos River, Blanco River, Purgatory Creek, Sink Creek, Willow Springs Creek, Cottonwood Creek and Crystal Creek. Parkland in these areas happens quite naturally due to the difficulty of building in floodplains. Small swaths of land would connect local creeks to create a loop all the way around the city. You would be surprised to see that the many acres that have been acquired as existing parkland by the city already fit into this vision. SMGA volunteers have built miles of trails in these greenspaces – trails with an orientation set for future connectivity. SMGA has been working for many years with the city and others to develop greenbelts and a Greenbelt Master Plan. This new addition to the Parks Master Plan will be an evolution of our Loop & Check concept shown below. Our goal is that parks that are destined to be created as the city grows will fit into the Greenbelt Master Plan and put San Marcos on the map as an outstanding and forward-thinking city.